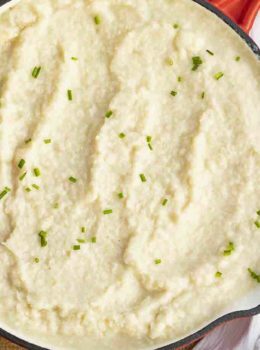 Mashed Cauliflower is a quick and easy substitute for mashed potatoes thats lower carb and fat thats totally creamy with no worries about lumps! Add the cauliflower and garlic to a steamer over boiling water and steam for 15 minutes. Remove from the steamer and let cool for 2 minutes before adding to the food processor with the buttermilk, cream cheese oil, salt and pepper and processing until completely smooth, about 1 minute.